Categories: Land Activities, Horseback Riding. Lahaina Stables has the perfect sunset ride for you. The incredible view from above the Launiupoko Valley across the Pacific Ocean, speaks to the hearts of lovers on the sunset trail ride with Lahaina Stables. Located just a few minutes south of the bustling town and busy beach parks. Lahaina Stables sits peacefully on the mountainside, gazing down on the world below. Check in at the corral begins with a safety briefing and basic horseback riding lessons. Great even for beginners, these horses know just what to do. Don’t worry if you have never been on a horse before. The friendly guides prepare you for your ride and make sure your equipment and horse are fitted properly. The horses here are happy and healthy. They are well trained and familiar with the old trails. Be sure to mention your riding ability when making your reservations. The ranch will play matchmaker to find you the perfect ride. 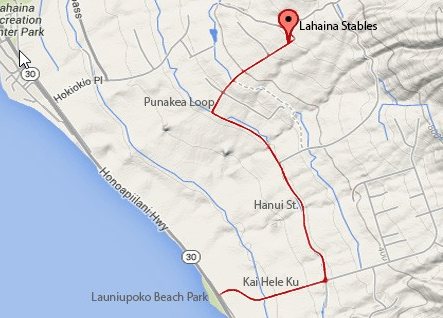 Your two hour trail ride with Lahaina Stables crosses the historic Launiupoko Valley. Learn about an area that played an important role in Hawaii’s days of sugar cane and Hawaiian history. Your trail guides are well versed in everything equestrian. Their background stories range from those with jockey experience, to horse owners and lovers from childhood, to animal science experts and Hawaiian history buffs. Appreciate their knowledge of the local area, culture and indigenous plants and animals. Take a journey across the rugged ground of the West Maui Mountains. Be captivated with the perfect Maui sunset below. Enjoy the wonderful weather on this side of the island, especially at this time of day when the sun has dropped and cooled the landscape. Stop over to rest and enjoy snacks and drinks at the mountainside “hale” (house). Admire the view and shoot a memory card full of photos. Great for families, kids and couples alike, their trail rides offer the perfect way to spend a Hawaiian evening, with an impressive vantage point for a classic Maui sunset. Bring long pants, closed-toed shoes, and sun-protection. Weight restriction 230 lbs, NO EXCEPTIONS. Children under 8 years of age are subject to Trail Boss’s approval. Drive toward the mountains at the Launiupoko Beach Park, and go to the end of the road until you see a roundabout. Turn left on Haniu Street, and go approx. 1 mile. Turn right on the second Punakea Loop and go to the top. Piiholo Ranch Zipline – Fly like a bird! Piiholo Ranch is a seven-generation local family cattle ranch offering horseback riding adventures and now Hawaii’s newest and longest zipline.